Depression is the most common and also the most treatable mental disorder occurring in women at all stages in their life. Despite medical advancements and numerous mental-health campaigns, clinical depression continues to be poorly understood and often stigmatized in our society. Frequently, it is not recognized as a legitimate condition, but rather a matter of a negative attitude. Keep reading to learn everything you need to know about clinical depression. Clinical depression, also known as major depressive disorder, is a medical condition that affects the mind and body, altering how a woman feels, how she thinks and behaves. Women are more likely to suffer from depression than men, and it is estimated that one third of women experience a clinical depression in their lifetime. Life events, like abusive relationships, losing a job, or loneliness, can cause depression. Family history might predispose some women to depression, but a specific gene responsible for it has not been identified. Personality traits, like being oversensitive to criticism or worrying a lot, might put some women at risk of depression. Medical illnesses can sometimes be so overwhelming that constant stress, fear, and prolonged worry might lead to clinical depression. Hormonal imbalance, particularly estrogen fluctuations, throughout women's life might result in depression. Drug and alcohol abuse often has detrimental effects on women's health, often leading to depression. Sometimes depression pushes women to seek relief in drugs and alcohol, worsening its symptoms. Brain chemistry, particularly related to brain neurotransmitters, is also believed to play a role in the development of depression, but research has not been able to provide more information. There are no known medical tests that can detect depression. 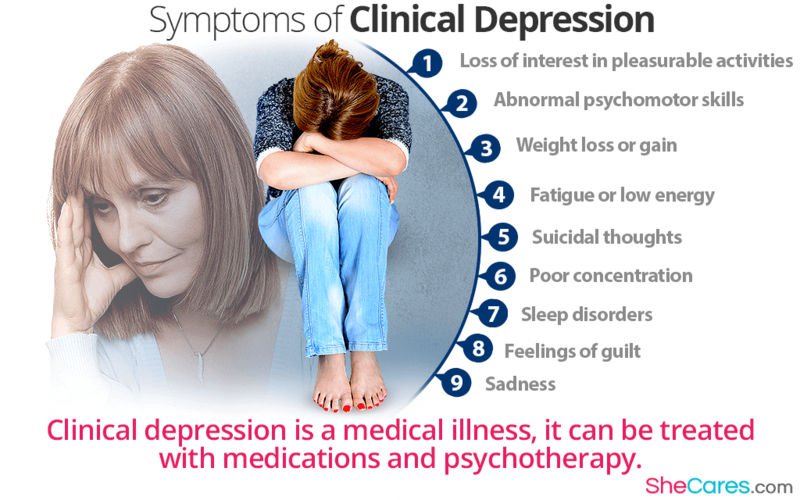 Since many of the symptoms of clinical depression might also be caused by other medical conditions, such as a thyroid disease, it is important to undergo a proper medical assessment with blood tests to rule out other underlying causes. Clinical depression is diagnosed if at least one of the two cardinal symptoms, which are sadness and loss of interest in pleasurable activities, occurs for at least two consecutive weeks. What Are the Treatments for Clinical Depression? Including meditation, light therapy, yoga, and acupuncture, have been found helpful as supportive treatments in coping with depression. Herbal substances, such as phytoestrogenic or hormone-regulating supplements, might be helpful in balancing the estrogen levels, which commonly fluctuate throughout your life. Especially cognitive behavior therapy (CBT) and interpersonal therapy (IT), can be effective in teaching women with depression to change their thought patterns. Medications effective in treating depression come in three types: antidepressants, tranquilizers, and mood stabilizers. Generally, it is not the preferred treatment for teenage girls. Clinical depression is a global concern, affecting millions of women at various stages of their life. Although the treatment methods have been shown effective, many women do not seek help. Raising awareness about clinical depression can help create an environment, where women feel safe to come forward and find help. If you feel overwhelmed by your depression, ask your doctor to help you find effective ways to get better.